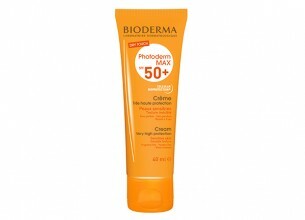 Photoderm MAX Dry Touch Cream is non-comedogenic, very water-resistant and photostable. Hypoallergenic, fragrance-free and paraben-free and provides excellent skin tolerability. Photoderm MAX Dry Touch Cream has a particularly matte texture that instantly blends into your skin, leaving it shine-free and dry to the touch. It does not leave a greasy film or white layer on the skin, so it’s ideal for people with darker and oilier complexions, and ideal for use in high-humidity climates. Availability: Clicks, Dis-Chem, independent pharmacies and laser clinics. Dermatologists and online from shoplongevity.com. I’ve used a lot of sunscreens, and this is top of my list. I have oily skin and I absolutely love the matte effect it has. No greasiness or oil – just all-round protection on silky soft skin. I love that it absorbs so quickly and that it doesn’t leave any white marks. The SPF50 offers long-lasting protection and I feel happy knowing my skin is protected. If you’re looking for a high quality product at an affordable price, I highly recommend this, all year round.